Gone are the days of the flat water rectangular city park pool with a little wading pool next to it. We are now seeing full-blown waterpark aquatic centers that feature a wide array of differentiating attractions. One of the latest attractions being featured in municipal settings are creative wave pools—wave pools that are different than the original keystone shaped wave pools that used to be the standard in municipal aquatic facilities for decades. There are now wave pools that don’t necessarily look like a wave pool. There are pools that have beaches at both ends and the waves are generated at the center of the pool. You are starting to see communities, especially in the Midwest, that are putting rivers in their aquatic facilities, but rather than being a lazy river that you leisurely float around in a tube, they are adding wave generation equipment, booster pumps and things of that nature to make them more of an action river experience. Also trending in municipalities are adventure pools. These are being incorporated into the municipal aquatic centers, in that you have a pool that may have a climbing wall, and a jumping ledge built into a wall somewhere. The effect is like people used to do in the old rock quarries. Pools that are actually being built intended to re-create that effect. Included in these adventure pools could be crossing structures, inflatable obstacle courses, pool basketball and more, all designed to engage guests of all ages and skill levels. Learn more about the types of amenities you can incorporate into your municipal water park in order to boost community engagement and increase attendance. 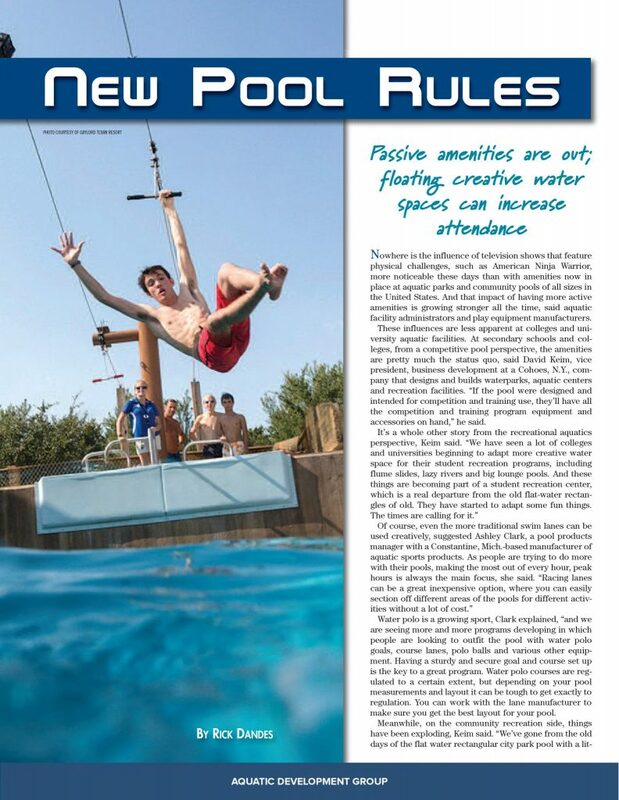 Download the “New Pool Rules Article” today!